I tend to stay away from products that shout about love from the rooftops. 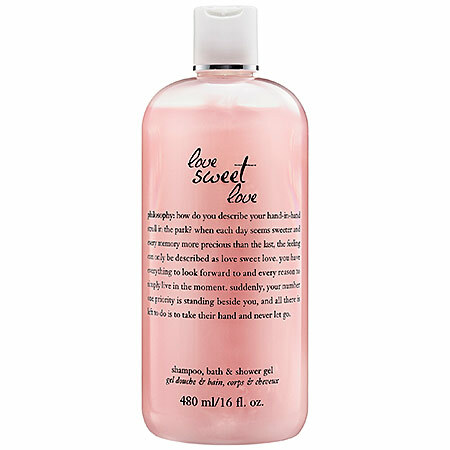 But then I came across Philosophy Love Sweet Love Shampoo, Bath & Shower Gel and, well ... I changed my tune. The scent is delightfully fresh and fruity. I love using it either last thing at night or first thing in the morning. And the bright pink hue just makes my shower that much more fun! As with every Philosophy 3-in-1, you can use it as a body wash, bubble bath or shampoo. I usually use mine as a body wash, but it does create an amazing amount of bubbles if you want to take a relaxing bath! Philosophy Love Sweet Love Shampoo, Bath & Shower Gel retails for $22 at sephora.com.